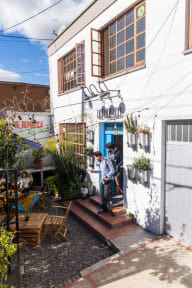 Republica Hostel Bogota i Bogota, Colombia : Boka nu! Really liked the cube that you get to sleep in. You have your own light, power outlet and curtain. This makes the hostel a bit more unsocial but good for sleeping. Breakfast had two different options which was nice. Bathroom was small and could use some more cleaning. Showers and toilets in the same place so not so much privacy here. The area felt safe to walk around at night but was easy to take public transport to the historical center.